OK SO, yesterday I did something a little crazy… I lined up for the Shake Shack x Momofuku pop up! I say “crazy,” because if any of you have paid attention to the media outlets regarding this event, you would’ve seen the INSANE line up. The one-day pop up was scheduled to run from 12:30PM-6:30PM at Momofuku Daisho. A very dedicated friend (who shall remain nameless at this point in time) and I were lucky enough to reach the line at around 11:30AM. By that time, there was a lineup approximately 150 people deep. Most people would see this line and say “AW HELL NAW,” but it’s me you’re talking about… do I even have to remind you?! Anyway, if you didn’t have a chance to scoop one of 1000 coveted ShackBurgers yesterday, you can always live vicariously through this post… or laugh at me, whatever! Either way, this post is filled with mouth-watering burger goodness. You’re welcome. Media was EVERYWHERE… I even got interviewed and photographed by Toronto Life! After two hours of waiting… we’re finally in! and “Follow the green burger” we did! Oh, and for those thinking they could scoop some burgers for their lazy friends… that’s a big NOPE. Full disclosure: they actually handed out menus outside while we waited, but here’s a nice ~aesthetic~ photo for your eyes feat. A Shake Shack x Momofuku coaster that I totally brought home! Whether you were dining in or taking it to go, all orders came in these branded paper bags. THIS IS WHAT WE CAME FOR!!! 1. We waited two hours total to finally snag a bite of the burgers: one hour before the start of the pop up and then another hour after the doors opened. 2. Yes – it was cold. Fingers and toes had to be wiggled periodically in order not to lose sensation in them… BUT we couldn’t have asked for better “winter” weather to endure. 3. Yes – the burgers were delicious and YES it was worth the wait. 4. 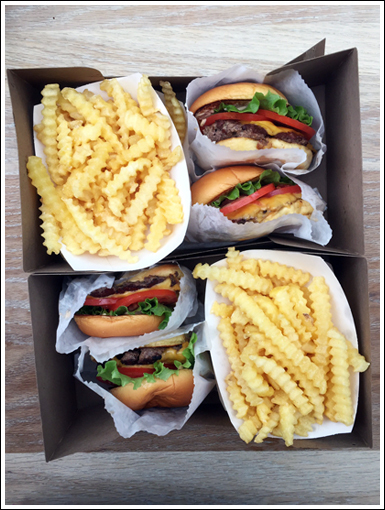 Compared to the US version of Shake Shack… I couldn’t tell you if there was a difference because I’ve never had Shake Shack before! Hence, why I waited so long just to try the yumz. 5. And finally, yes – I would do it all over again. Now, why the heck would I subject myself to this experience? Well, why wouldn’t I? Yes, it’s quite absurd to have lined up for two hours for just… burgers, but guess what?! I LOVE BURGERS, and I’m not sorry! I think waiting is part of the whole process/excitement of it all. I actually quite enjoyed myself; despite being underdressed for the weather … we even made a new friend! The good people of Kind were generous enough to give us some snacks while we waited, and we even got some Shake Shack swag to compensate for it all. Everyone along the way was actually very nice. Well, except for one lady! Moving along to more important things, ie. THE FOOD! Can I please have a moment to reminisce over one of the best burgers I’ve had in my entire existence?! The bread: soft and fluffy. The patty: super flavourful, topped with a slice of melted cheddar cheese. The toppings: simple – two slices of tomato, fresh lettuce and the secret weapon: their infamous ShackSauce. All in all, a modest-looking burger with a HUGE flavor punch. A great go-to burger… if it were available on the regs here in Toronto. Some people were commenting on how small the burgers were, but boy, were they filling! I didn’t expect to get full off one order of the ShackBurger and Crinkle Fries, but I totes did. And the fries… THE FRIES! I literally could not stop eating those crispy on the outside/smooth on the inside, golden bites of heaven. If you didn’t have ketchup, it wouldn’t even have mattered… they were perfect on their own. Another thing to note was that the branding was on point! Everything seemed authentic and it made the wait extra worth it, seeing how much effort was put into every little detail – SS burger neon sign and all! Only thing that was missing were the signature trays with the printed wax paper, but hey… you can’t have it all! We finished our meal with some treats from the Milk Bar Bakery. Our tummies definitely got spoiled that day. I couldn’t think of a better meal! 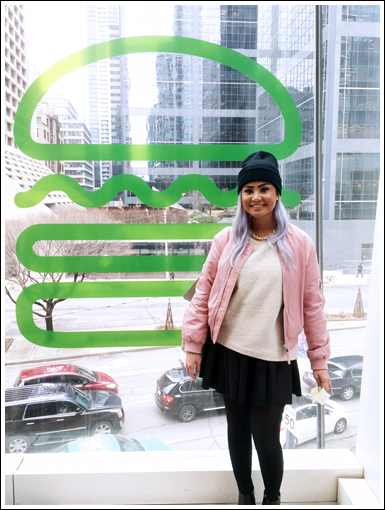 For the excitement of the experience, the amazing hospitality and for the super delicious food, I would give the Shake Shack x Momofuku Toronto burger pop up a solid 5 stilettos! Oh, and by the way, by the time we left the place, the line up not only looped to the next street, but totally wrapped around the block! Hundreds and hundreds of people lined up, and after reading a few tweets from the event, some people lined up only to be told that there weren't any burgers left... bummer! This post goes out to you!